Widespread frost will descend on the south east of Australia this weekend. Picture: Sky News Weather. SEVERE frost and temperatures plunging south of -5C, it's going to be a cold weekend across much of the country. A high pressure system brooding across the continent will bring clear skies for many places. In deep winter, that lack of cloud cover means one thing - cold nights. Sky News Weather's Tom Saunders said that as the sun sets, Australia will "lose heat rapidly" with Sydney and Canberra particularly chilly on the weekend. Melbourne, Adelaide and much of Tasmania could see showers on Saturday and Sunday. A major "rain event" is headed for Queensland and New South Wales next week. Early on Friday morning, Adelaide and Canberra shivered through their coldest mornings of the year so far. Elizabeth, in the South Australian capital's northern suburbs, drifted down to 2.1C just before 8am; Nuriootpa, in the Barossa, bottomed out at -1.2C at 7am. Canberra struck an icy -5.1C on Friday morning. One weather map graphically illustrates how that chilly weather is only set to continue. Bathed in purple, the map shows the march of frost across the south east this weekend - much of it severe. 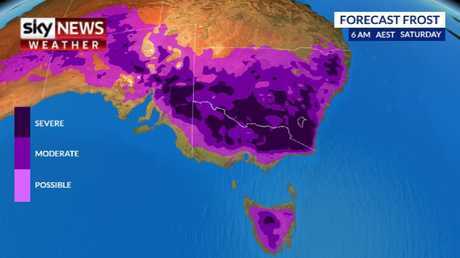 "Under the high pressure system, South Eastern Australia is losing heat rapidly overnight and as result there will be widespread frost with temperatures even dipping below -5C in some towns on the ranges," said Mr Saunders. "On Saturday morning, temperatures will be close to freezing so frost will be widespread with severe frost in northern Victoria, much of southern and central NSW and many parts of South Australia. On Sunday morning, expect much of the same." Some of the frost could reach coastal areas. "Canberra will be at -1C on Saturday and Sunday morning and could easily get colder. Sydney will be quite chilly too with 7C on Saturday morning." he said. The Harbour City should top out at between 15-17C on the weekend. Adelaide will see lows of 8C and highs of 15C on the weekend with Melbourne dipping to 6C on Saturday morning but getting to 13C on both days. Hobart will get as cold as 6C reaching a high of 12C on Sunday. 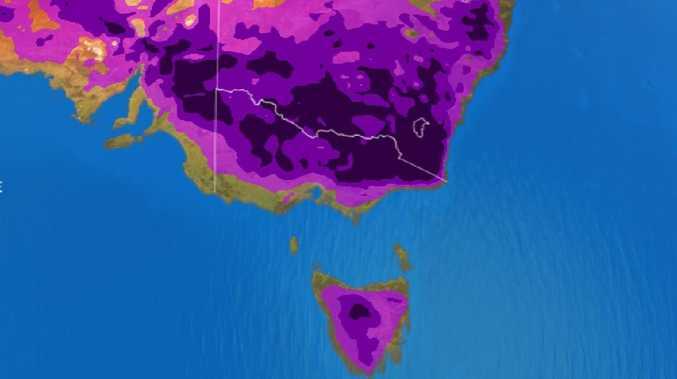 Across the Nullarbor, Perth is set to see 21C this weekend and a low of between 7-8C. In the Top End, a sunny Darwin will get to a maximum of 31C. Brisbane will have cool mornings of around 9C and then pleasant daytime highs of 23C. Under clear skies night and early morning temperatures will plummet. Picture: Sky News Weather. While much of the country will be dry, any rain there is will be concentrated in the south. 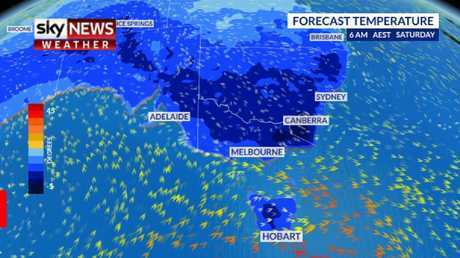 "For South Eastern Australia, a cold front moving through Friday will bring a burst of showers to Tasmania and then on Saturday to southern Victoria and coastal South Australia, but there will be no rain north of the Victorian ranges," said Mr Saunders. While southern Victoria could see up to 20mm of rain on the weekend, the Murray basin isn't forecast to see a drop for the next eight days. However, the skies could open further north, in northern NSW and Queensland, early next week. If they do, it will bring a much-needed dumping to the tinder dry interior. "An upper trough is over the interior and as it moves east it will run into moisture from the Coral Sea and the Tasman Sea. As a result we're expecting a rain event in the east (coast) to bring good totals. Heavy rain is forecast for NSW and Queensland early to mid next week. Picture: Sky News Weather. "There will also be a front bringing rain to the south west corner of WA on Tuesday or Wednesday." Mr Saunders said Wednesday would likely be the peak of both systems. On the east coast that could mean rain over areas including Longreach, Bourke and Dubbo as well as Sydney and Brisbane. 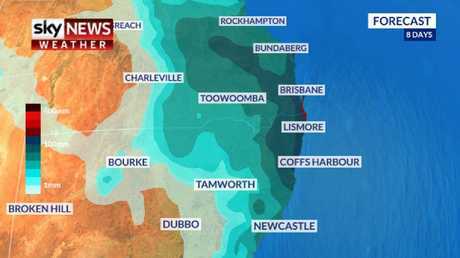 The heaviest falls, of up to 100mm, could be over the northern NSW and southern Queensland coasts.